Hedera Helie.�Ivy is known by all. A drachm of the flowers decocted in wine, restrains dysentery, or bloody flux. The yellow berries are good against the jaundice; and for those who spit blood, and the white berries being taken inwardly, or applied outwardly, destroy worms. Taken in wine, they help to break the stone, provoke urine, and women's courses. 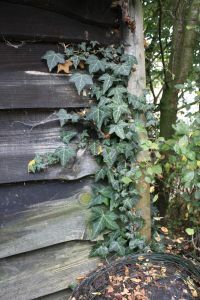 The fresh leaves of Ivy boiled in vinegar, and applied warm to the sides of those who are troubled with the spleen, ache, or stitch in the sides, give much ease. The same applied with Rose-water, and oil of Roses, to the temples and forehead, eases the head�ache. The leaves boiled in weak wine form an excellent wash for ulcers, sores, burns, scalds, etcetera. The juice of the berries or leaves snuffed up into the nose, purges the head and brain of rheum, which causes defluxions into the eyes and nose; the same dropped into the ears, cures sores therein. The fresh leaves applied to corns and bunions effectually cure them. Intoxication by wine, the effects are removed by a handful of leaves bruised, and gently boiled in wine, and the liquor drank.